Once the parade has reach it's end point at Arnarhóll, Lækjargata course an outdoor concert starts with songs and spectacle. 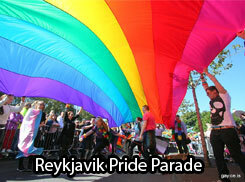 Performers include wll known Icelandic singers, bands and entertainers. Gayice.is brings you photos and clips from Drag-Súgurs Christmas show from the 22nd of December 2015. A wonderful mix of drag, comedy, singing and more followed by the amazing Andrea Gylfa and her talented half naked santa on the guitar. 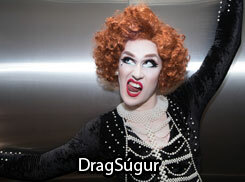 Drag-Súgur Drag-Cabaret and then some! 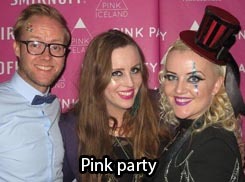 Last friday night was Drag-Súgur’s first event at Gaukurinn with a variety of performances, including live music, stand up, circus, and of course; Drag! The show had a very international flavor with Jonathan Duffy, Australian standup comedian, hosting the evening and performing two songs and Hungarian Pixy Strike performing drag. Snapshots from the Blue Lagoon at Bears on Ice weekend September 2015. Snapshots from the Golden Circle tour at Bears on Ice weekend September 2015. Snapshots from the welcome party at Bears on Ice weekend September 2015.